Singapore-headquartered tanker owner AET has named its first two LNG dual-fuelled aframaxes. 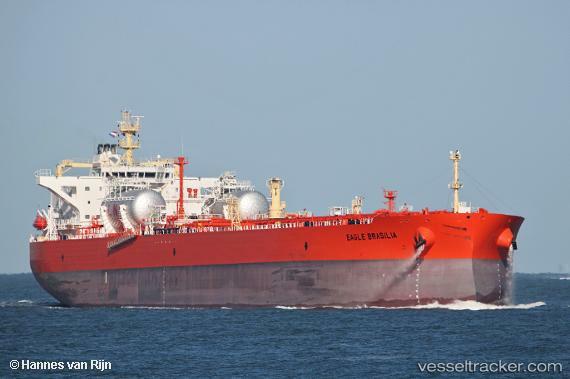 The Eagle Brasilia and Eagle Bintulu were named at Samsung Heavy Industries (SHI), and build on parent company MISC's longstanding experience with a LNG as owner and operator of LNG carriers. LNG fuel is supplied through two type-C tanks of 850 cubic metres each arranged on the main deck aft port and starboard and designed for ship-to-ship bunekring. The vessels have a range of approximately 6,000 nm when using LNG as a fuel. By using LNG as fuel SOx emissions are reduced almost 100% exceeding the requirements of the global IMO 0.5% sulphur cap for marine fuel from 2020. Both vessels will be on long term charter to Shell International Trading and Shipping starting operations in Q4 this year, primarily in the Atlantic Basin.